Tuition-free college just became a reality in New York. Though other places have free community college, New York is the first to make tuition free at four-year public colleges as well. Governor Andrew Cuomo introduced the tuition-free legislation in January and lawmakers approved the plan this weekend. Middle-class families could save up to $25,880 for a four-year degree at a State University or City University of New York school. But not everyone will benefit from the new Excelsior Scholarship. You must be an undergraduate enrolled at a SUNY or CUNY school. There's also an income cap, which will be phased in over the first three years. Starting this fall, families who earn no more than $100,000 a year are eligible. The income cap will lift to $110,000 next year and will reach $125,000 in 2019. It's based on the adjusted gross income reported on the family's most recent tax return. Do graduates have to stay in New York? Yes. After they graduate, students who received the scholarship must live and work in New York for the same number of years they received funding. If they leave the state, their scholarship will be converted into a no-interest loan. This does not apply to those who go on to graduate school out of state. They will be allowed to defer the requirement, but must return to New York within six months after finishing their advanced degree. There will be exceptions for students who relocate due to "an allowable hardship," according to the state's Higher Education Services Corporation. No. Students can enroll at any age and don't have to be a recent high school graduate. But you cannot already have a bachelor's degree or be in default on existing federal or state student loans. No. Students must be a citizen, permanent resident, or refugee. Governor Cuomo pushed to make undocumented students eligible for the scholarship and other state aid, but that provision was not included in the final budget. Yes. Students must remain enrolled full time, taking 30 credits a year. Some of those credits could be taken during the summer or winter semesters. But there will be exceptions. Students with disabilities will not be required to register full time to be eligible for the scholarship, according to SUNY. Students are also required to maintain the GPA necessary to stay in school and finish on track to graduate on time. The scholarship covers the cost of tuition, which is currently $6,470 annually at four-year schools and about $4,350 a year at community colleges. But students will still be on the hook for fees and other expenses. 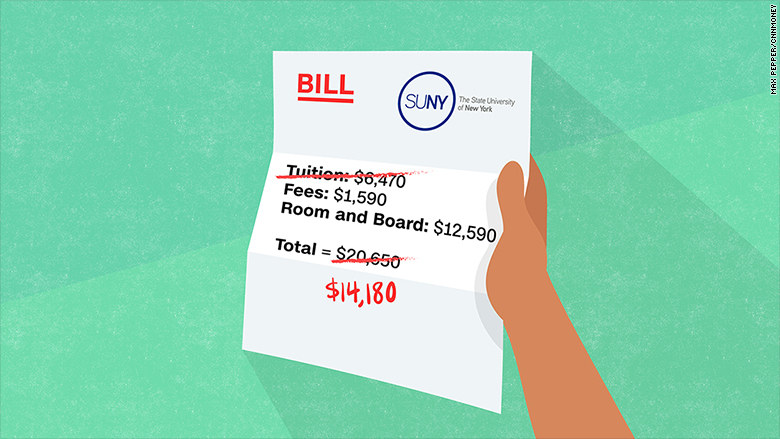 At a SUNY school, fees cost $1,590 annually and room and board for those living on campus was $12,590 this year. Books could run you another $1,000. At a CUNY, fees cost an average of $475. Most students commute, but if you're living away from home, the school tells students to expect to pay $10,386 for housing and $3,283 for food. But students could see lower costs for text books next year. The budget included $8 million to help SUNY and CUNY offer educational resources including e-books. Will tuition go up for those who don't get the scholarship? It's possible. The state budget allows SUNY and CUNY to raise their tuition by $200 a year for the next three years. What happens to other scholarships and financial aid? If a student receives a need-based federal Pell Grant or a New York Tuition Assistance grant, they must use those first to pay for tuition. The Excelsior Scholarship will cover the remaining cost of tuition, but can't be used to cover additional costs for fees or room and board. The Excelsior Scholarship is not intended to replace other merit scholarships which can be used for expenses other than tuition. And students will remain eligible for federal student loans as long as they fill out the FAFSA. Who pays for the free-tuition program? The state will increase spending on higher education to cover the cost of the program. The governor's office said it expects it to cost $163 million in the first year, before it's fully phased in. SUNY and CUNY will not be expected to pick up any of the cost for at least the first four years. A special part of the legislation protects the state's investment in the colleges for that time period. A SUNY spokeswoman said the school does not expect to see any revenue losses under the Excelsior Scholarship because of that protection. What will be the impact on SUNY and CUNY? More students are expected to enroll in the state's community colleges because of the scholarship. SUNY said it is still reviewing how an influx of students might affect campus needs for additional faculty and staff. CUNY did not immediately respond to a request for comment. Is there any help for those who already graduated? No. Those who have already graduated from a SUNY or CUNY school won't get any help from the Excelsior Scholarship. 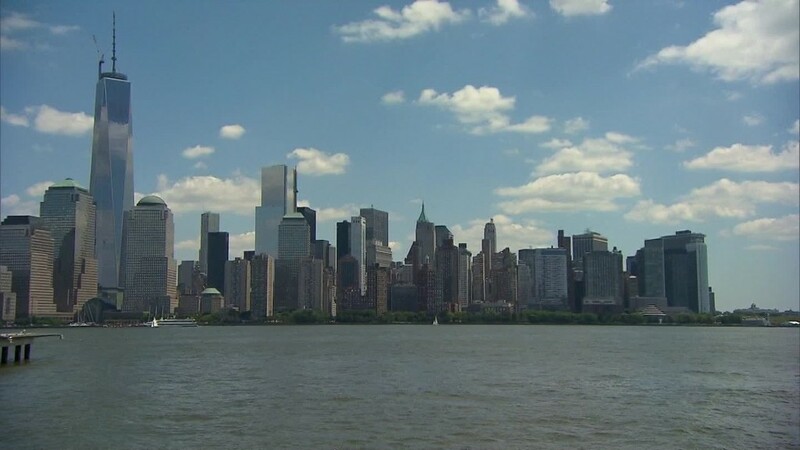 But New York's "Get on Your Feet" program will pay up to two years of federal student loan bills for residents who earn less than $50,000 a year and earned an undergraduate degree at a any college in New York since December 2014. The application for the 2017-2018 school year was made available on June 7 and can be found here. You must submit the application by Friday, July 21.